Need more storage areas? Consider using your attic storage options. See the photo on the right of the new attic steps. Some attics have easy access. Some do not. Our attic had a tiny opening in the ceiling of a hall closet. So tiny in fact I am amazed that My husband could even go through it! See the photo on the left.The opening was about 15 inches by 30 inches. It was very awkward and anytime he needed to get in the attic the closet had to be totally emptied out, including the shelving. Needless to say we did not use the attic for storage. Yet the space in our attic was needed to ease the overflow of items we had stored in closets and our garage. You may have perfectly good attic with no way to enter it, or an awkward opening like ours. We decided to make use of the valuable attic space and add an easier entrance to the space. I'm so glad we did. Attic steps come in a variety of materials (aluminum and wood) and weight limits. I recommend getting the heavy duty aluminum ladder to withstand the weight of the person and the items that are going to be located in the attic. READ THE INSTALLATION INSTRUCTIONS THAT COME WITH ATTIC STEPS YOU PURCHASE. FOLLOW THEM, THEY WILL TELL YOU EXACTLY WHAT TO DO TO INSTALL YOU STEPS. 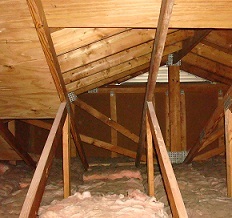 While choosing the location of the attic steps determine the direction that the roof joist run. Attempt to install you attic steps parallel and in between the roof joists if you can. If attic steps have to be installed perpendictular to joists consult a qualified contractor to modify the joists, to insure that you don't damage your house, if you are unsure about installing them yourself. You can still install the steps. After determining the location of the attic steps, mark and cut drywall to the size instructed in the installation guide. 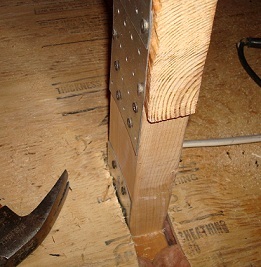 Then using 2x4's install framing for steps per installion guide. Installing the steps in the opening is a two person job. While one person holds the steps in place the other person, from the attic, attaches 4 straps that are attached to the steps. After attaching straps open the steps, but do not stand on them at this time. Pre drill holes on step framing and attach to the opening around the ceiling. As instructed in the installation guide. You will have to cut the feet of the steps depending on your ceiling height. At this point you are ready to use the steps. You need to install the trim around the opening and install the handle on the steps door. 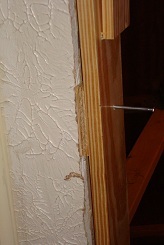 The trim for around the opening is not incuded with the steps. instaall trim and paint the trim and door to match your existing ceiling. 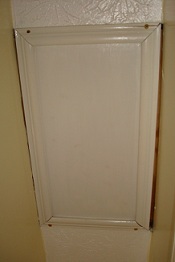 After you have completed the finishing touches the door is not very noticable. After installing your steps in order to get the most out of your available attic storage space you will need to install a floor in your attic. This can also be done before the steps are installed as long as you use a ladder to enter the attic. That is how we installed our floor. It also makes the movement in the attic safer while working on the installation of the steps. Because before the floor is installed the only surface you have are joists and sheetrock and insulation. You cannot walk on these surfaces. And you could fall thru the ceiling....you don't want that to happen. The floor can be built inexpensively with plywood. We used 1/2 plywood for our attic project. The opening into the attic allows access of plywood if you cut the 4x8 sheets into 2x8 sheets and place them in the attic via the opening cut for the steps. When installing the floor in your attic You will need to cut notches in the plywood to allow for your roof trusses and joists. Screw the plywood down to make the attic floor. Do not nail it down. You may need to remove a section of the plywood floor to do some modication to some electrical or other issue in the future and nailing the plywood down would mean alot more work to remove it. This would also be more likely to cause damage to your sheetrook walls with the pounding from the hammer. So screw the plywood down to avoid problems. We installed 5 sheets of plywood in the attic for now. This can be changed as our needs change. 5 sheets of plywood is 160 square feet of storage which is equal to a 10 x 16 area. That is alot of storage. But we have the option of adding even more as we need it. Focus on flooring the highest parts of the attic for maximum storage. Also floor around the attic door opening for saftey and ease of movement. 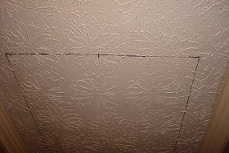 Attics usually have nails sticking thru the roof from the outside. This is a hazard. Install good permanent lighting in your attic. This way you can see the area you are entering. Most attics are not open and allow for standing up fully so you will have tight areas to move around in. Good lighting is esential to really benefit from your new attic storage space. That is better than having to carry a flashight with you each time you go in the attic. Also, install a electrical outlet for adding additional items if needed. 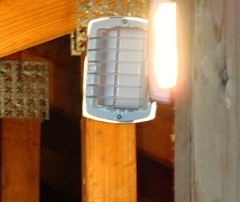 We have a good halogen light fixture close to the opening that lights up alot of the area and an outlet if we need it. The light is located close to the opening so it can be reached as soon as needed. You cannot see what you are looking for without good lighting. 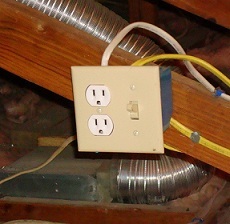 Installing the light fixture insures that you will be able to locate the items u are storing in the attic storage area. Now the Good Part- Using the New Attic Storage Space! After working on getting access to the attic storage space, adding the floor, and lighting it is time to make use of the attic storage space. The attic can get very hot in warm months. We intend to install an exhaust fan in our attic before it gets to hot. Some items can be damaged with excessive heat. Cold- The attic is going to be colder than your house, so dont store items that can be damamged by cold tempuratures. 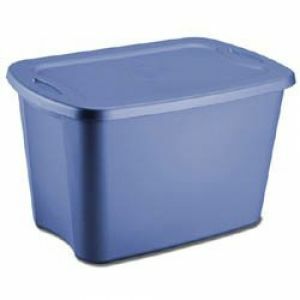 Determine the size of containers that can fit into you attic storage opening and store your items in good containers with lids that fit properly. This keeps the items clean and dust free. Organize the space according to use. Seperate seasonal items from travel items etc, and keep the space clutter free for quick and easy access when you need to get something from the attic. Doing this will allow you to really enjoy the added space you have added without dreading to have to go to the attic and find things. 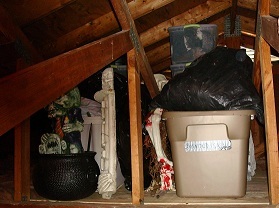 As you can see I have stored my Halloween Decoration in the new attic space. As frightening as those can be...good lighting is definitely needed! Get the Storage containers you need here! This product usually arrives in 2-8 business days, depending on destination, including order processing and shipping. Stacking storage units give you a simple way to create order in your garage,attic, closets, or anywhere you need organization. These sturdy, durable 18-gallon plastic totes are ideal for keeping out-of-season clothing, blankets, sleeping bags and other items dry and clean. Lids have recessed surface area for secure stacking; contoured end panels have integrated handles for easy carrying. This tote box system is designed to nest compactly for efficient shipping and space-saving storage. Available in Lapis Blue. Sold in sets of 2, 3, 4 and 6 . Interior Dimensions: 12 1/2"W x 18"D x 14 1/2"H. Made in America. There are other options to consider for storage other than attic storage. You could rent a storage building and pay a monthly fee. Or your could build or purchase a shed. We are going to build a shed next year but we needed something NOW! We considered renting a storage space. But, after calculating the costs involved, we decided that we can add attic steps and a floor and lighting for less than the cost of the storage building. And we would have the attic storage space all the time instead of giving it up when we stopped renting the space. So adding access to our attic is the best solution for us. It may be for you too. We are using the attic storage space for seasonal items and traveling necessities that were taking up room in our closets and garage. Now I have more storage in the closet under the stairs, which is next to my office. That will be nice!